The first thing to consider when placing an order with us for your wooden gates are the sizes required. For the basis of a quote a rough idea of the sizes needed is ok (to within an inch/25mm or so in both height and width is ok). Once you’ve had a quote, if you then want to proceed with an order we need definitive sizes to make the gates to. Generally wooden gates would be fitted in an existing opening, either between walls or wooden posts (either fixed to a wall or sunk into the ground). 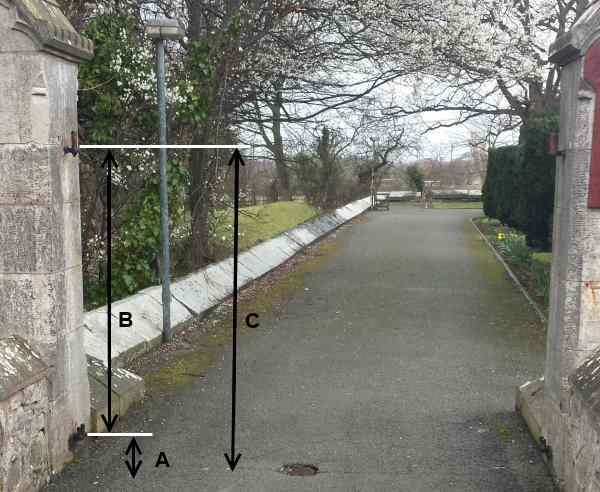 The other measurement we require is the height of the gates, an allowance of at least 2″ (50mm) should normally be made for clearances under the gates, but more or less maybe required depending on your circumstances – such as a driveway that slopes away across the opening. To manufacture the gates we require the overall opening width (between either the walls or posts if any are present). 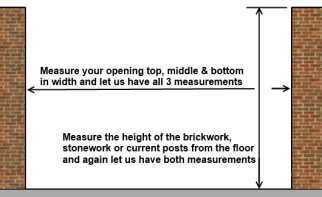 If your opening appears to be out of plumb (for example wider at the top than the bottom or vice versa) then it is always recommended to measure the opening at floor level, middle and top just to be on the safe side and provide us with all three measurements, so we can manufacture the gates to suit, less the clearances required. 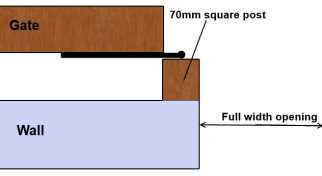 If you already have posts fitted and your opening is out of plumb then we would normally manufacture the gates to the narrowest measurements but this is dependent by how much the three measurements differ – in some situations it can be best to work to an average measurement. If you’ve no posts currently in place and you intend to fit gate posts to a wall and your opening is out of plumb we can manufacture tapered posts that will get rid of most of the size difference for you (this is dependent on how much the walls are out of plumb). If you are in any doubt when measuring up for the gates do not hesitate to give us a call on 01745 362444 or drop us an email to [email protected] for advice. As well as opening widths, it’s also useful for us to know how you intend to hang the gates so we can allow relevant clearances – we can allow clearances for you if you prefer. Another thing we need to know is will you be fitting posts to a wall (we can supply wall fixing posts in the same material as the gates) or will you be hanging your gates between existing posts (either free standing sunk into the ground or wall fixing posts). 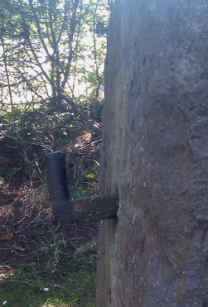 You can find out a bit more on gate posts attached to a wall here and freestanding posts sunk into the ground here. If fitting gate posts to a wall, within the brickwork or stone opening then as well as the usual clearances required for the gates to operate we also have to allow for the fixing stiles or wall fixing posts. Usually you would fit the hinges to either the rear or front face of the posts (rather than within the opening itself). If you’ve already posts in place then all we need is the tight width from post to post and we can allow the required clearances. Looking for single pedestrian gates or garden gates? 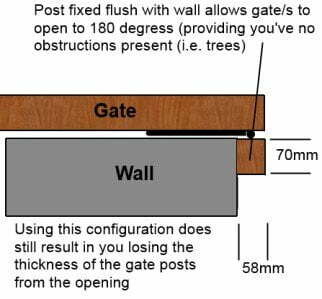 If you’re fitting double gates between brick or stonework and again using gate posts fitted to the wall, then as well as allowing for the posts we need to allow a bit more clearance – 30mm in total split three ways, 10mm between the two gates and 10mm between each gate and fixing stiles/ wall fixing posts. Looking for double driveway gates? If fitting gate posts to a wall, within the brickwork or stone opening then as well as the usual clearances required for the double gates to operate we also have to allow for the fixing stiles or wall fixing posts. Trying to maximise your gateway? Both methods mentioned above have a drawback if your tight for space on your brickwork opening. When fitted as shown in the first two configuration pictures your gates will only open to just over 90 degrees before they catch your brickwork or stonework – this will result in you losing the thickness of the gates from your opening as well as the two fixing stiles. 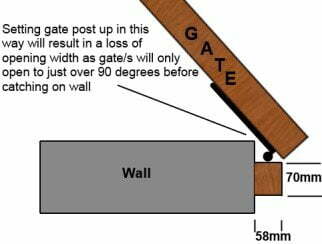 Good news however as if you are stuck with a gateway that is tight for space then there are a couple of things you can do to gain the maximum possible opening for your wooden gates. Want your gates to open 180 degrees? If you hang the gates in this configuration then providing you’ve no obstructions your gates will open to 180 degrees. You will however still lose the thickness of the posts (2 x 58mm = 116mm in this instance) from your opening. Even better news is we can further maximise your gate opening to give you the widest possible gateway and still have gates! To further maximise your gateway if you’re really desperate for space is to remove the gate posts from your opening. Simply fit the posts to the inside face of the wall (if the gates are to open in) and you’ll get the maximum useable opening possible (if the gates are to open out then you’ll have to fit the posts to the outside face of the wall). This then gives you the total maximum gateway providing your gates are able to open to 180 degrees. All the above methods show are if you require the gates to open EITHER in or out. If you want the gates to open BOTH in and out then you will need Fieldgate hinges (also known as wraparound hinges). When hung this way, the clearance gap between post and gate can vary depending on the hinge size – please contact us for more information. Clearances between two double gates hung this way would be 10mm as would clearances between a single gate hung this way and the clashing post (latch post). This configuration will result in a narrower than normal opening as the hinges have to be fitted within the opening where the gates sit. Hanging gates that are to be automated? If you’re intending to automate your gates then you really need to speak to your gate automater, as required clearances can and do vary depending on the type of automation system you will be using – we do not recommend DIY automated gate installs as incorrectly fitted they can kill. If you’ve got built in, existing hinge pins that you would like to hang a new pair of gates off then this can be done. The measurements we need to make something to suit your opening and hinge pins do differ slightly, firstly we need the height from the floor to the underside of the bottom hinge (not the underside of the hinge pin). We also then require the distance from the floor to the underside of the top hinge (again not the underside of the hinge pin!). These two measurements will then ensure that we make the gates with the rails at heights to suit your current hinge setup. To fit the gates to existing built in hinge pins (hooks to build), this assumes that you have the hinges to fit. If you do not have hinges and your hinge pins have recently been built into the pillars then you should source the hinges from the same supplier as the pins to ensure the hinges fit. On older openings where the pins have been built in several years before it can often problematic sourcing hinges to fit – older pins will be Imperial sizes, whereas modern hinges (and pins!) will be Metric sizes. In most cases you will either have to have your gate hinges specially made to ensure a good fit or do as some of our customers have done and remove the pins entirely. I’ve had a metal gate with built in hinge pins, can I fit a wooden gate to these? In most cases if you’ve removed a wrought iron gate and are left with the hinge pins in the brickwork or stonework then you will not be able to use these to hang a set of wooden gates. Usually hinge pins for metal gates do not protrude out of the brick or stonework enough meaning you will not get the desired clearances between a wooden gate and you wall (your timber gate will probably bind or catch on the wall when opened). Secondly the hinges for timber gates will more than likely not fit the existing pins.